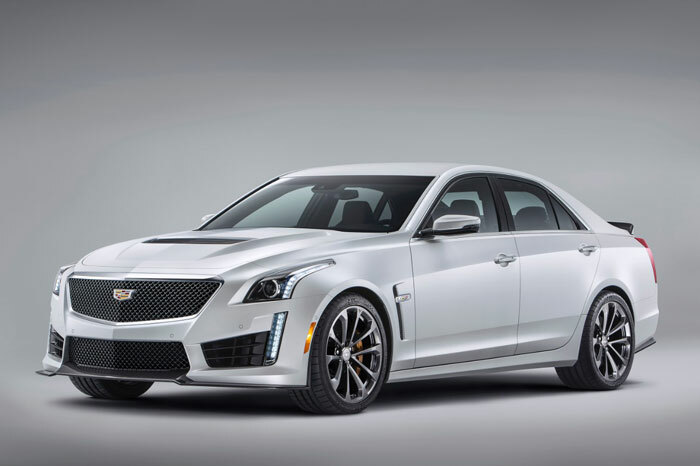 Cadillac is giving up some details on the 2016 CTS-V luxury performance car and it sounds like it will be a beast. The 2016 CTS-V will hit dealerships in late summer of 2015 and under the hood it will pack a 6.2L supercharged V8 engine. That engine has enough power and torque to make the 2016 CTS-V the most powerful product in the 112-year history of Cadillac. The supercharged V8 engine will produce 640hp and 630 lb-ft of torque. That much power and torque will propel the CTS-V to a top speed of 200mph. Keep in mind that this level of performance comes from a 4-door luxury car. Sadly, no 2-door version has been announced. Cadillac says that the car can reach 60mph from a standstill in 3.7 seconds. Other features include a standard carbon fiber hood and available carbon fiber vent, front splitter, rear spoiler, and rear diffuser. The car gets Brembo performance brakes all around and third gen Magnetic Ride Control suspension. All the power from that V8 goes to the road via an 8-speed paddle shift automatic transmission. Recaro seats are available and Caddy equips the car with sticky Michelin Pilot Super Sport tires.